Earlier, the Midwest-Great Lakes SER Chapter Board of Directors voted to be exhibitors at the 2014 Natural Areas Conference held in Dayton, Ohio from October 15 to October 17, 2014. The Board felt supporting this international conference was important because it represented a restoration conference held within the boundaries of the Midwest-Great Lakes SER Chapter. Additionally, the Board of Directors felt this would be a great opportunity to promote our upcoming Chapter Meeting at the Chicago Botanic Gardens in March 2015 and the benefits of being a member of the Midwest-Great Lakes SER Chapter. Board members Rocky Smiley, Joe DiMisa, Jennifer Lyndall, and Lauren Umek collaborated in the development of the publicity materials for our exhibit. The Chapter also provided support for the 2014 Natural Areas Conference Planning Team through the contributions of its Board members. Specifically, Joe DiMisa served as a co-chair of Exhibits for the Conference Planning Team and Michael Enright was a leader of one of the conference field trips. Board members Roger Anderson, Joe DiMisa, Michael Enright, and Rocky Smiley contributed to the oral presentation program through their contributed presentations at the conference. 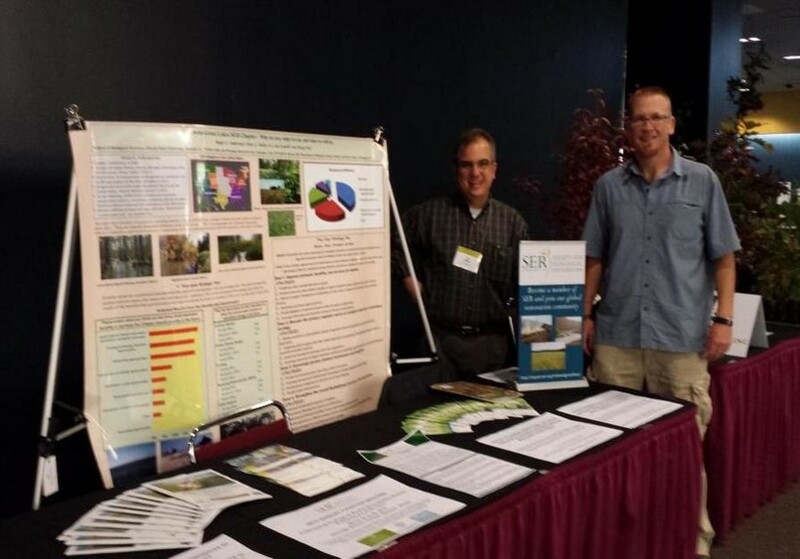 Joe DiMisa and Rocky Smiley with the Chapter’s exhibit at the 2014 Natural Areas Conference. The conference was a great three day event with two days of organized and contributed presentations from a wide range of disciplines and one day devoted to field trips. Restoration topics and issues were commonly discussed in many of the conference events. It was interesting to listen to the perspectives on restoration issues from those who do not consider themselves restoration specialists. The conference had a wide spectrum of nearly 300 international attendees representing county agencies, state agencies, federal agencies, University faculty, students, private consultants, and non-profit groups. Our exhibit was located in a high traffic area that provided many opportunities for meeting attendees to view our exhibit materials and discuss the benefits of Chapter Membership with Board members Joe DiMisa and Rocky Smiley.